Savoury corn waffles packed with spicy chorizo and tasty cheddar cheese topped with fried eggs, fresh kale and herbs. Fry off the chorizo until golden. Set aside to cool.. In a large mixing bowl, shift in the cornmeal, flour, baking powder and baking soda. Mix well. In another bowl, mix together buttermilk, sugar, a pinch of salt, eggs,melted butter and chorizo. Combine the wet and dry mix with a spatula. Heat the waffle maker with a dash of avocado cooking oil. When hot, pour the waffle batter. Sprinkle a little cheese and cook until done. Repeat until all batter is used up. Fry eggs until white is cooked but yolk is still runny. Stir fry the kale quickly with a dash of avocado oil to just warm through and season. 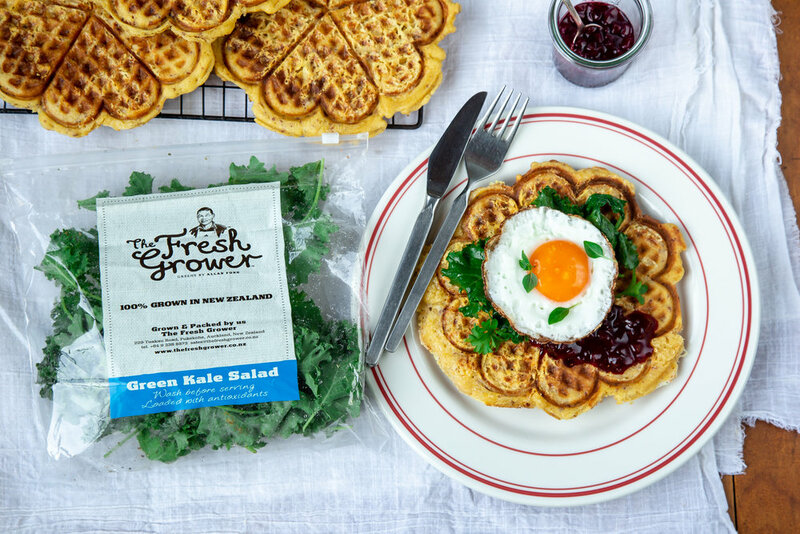 Stack the waffles with relish, kale and top with fried egg and fresh herbs.